Good day to you! Click here to play! I am famed animal documentarian Lord Percy Thistlebrushington III, and I bid you welcome to the 78,314th Annual Animal Football Cup, here in the Savannah. The first match will be the lion team, the Fighting Humans, against the elephant team, the Grassy-Hill Trumpettes. Before that begins, however, let's look into what the teams are playing for. Well, it looks like the majority of the prizes are exotic fruits, like cherries, lemons, watermelons, and so on. Oh, they'll be playing for football shoes and whistles, apparently. Strange for Savannah animals, but it's quite surprising that they can play football at all, isn't it? People say that I fake my footage, but when you see these splendid creatures playing for the glory of their species, as well as a shiny golden trophy, you just have to show the rest of the world. It looks like the first game is just about to start. I'm told the animals do accept bets on the outcome of these games, so humans should go over to the Game On! Slots booth to wager on which team will win - the lions or the elephants. The Game On! 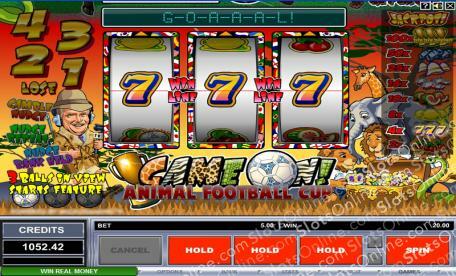 Slots feature extensive bonus features, such as nudges, nudge bank held, gamble nudge, hold, and a Soccer Safari Bonus game. The bonus game is triggered when 3 Ball symbols land on the payline. In the game, the player tries to stop the flashing meter on the prize that they want. There are 3 meters, each giving a multiplier value. It is possible to win a prize multiplier of up to 1000, awarding 1000 the credits wagered on the triggering spin.